YAY!! 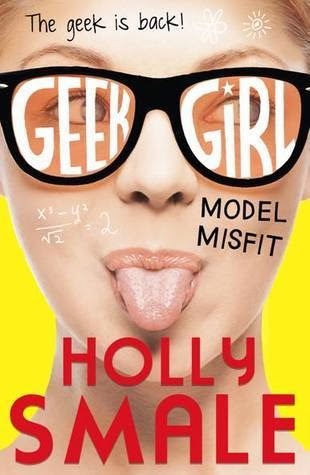 Another Geek Girl book! Oh my goshhhh I was SO excited when I got this approved via NetGalley from HarperCollins Childrens! I just HAD to read it straight away. And that I did. I just want to say a big thank you to HarperCollins Childrens for letting me read this amazing book. The fact that it is a review copy does not effect my opinion on the book whatsoever. I loved the story in this one just as much as I did in the first book. There's geeky antics, hilarious moments, romance, family and friendship bonds, and modelling. The cover of this book is so bright! It really catches your attention in a really good way. It matches the first book, and will look good on a book shelf. You will have no problem in finding it. I love the design of the cheeky pose with the geeky shades, and the equations on the face. The font is designed really well on the cover. When reading the synopsis to the book I was like "What could Harriet Manners possibly do next?" I was ready for more of Harriet. Harriet - Harriet is one of my all-time favourite main characters. She is so hilarious, full of random facts and is incredibly clumsy. I loved finding out facts from Harriet throughout the book. She would say and do so many great and funny things that I had myself laughing and giggling to myself. Nick - Nick AKA Lion Boy is back. How can no one not like Liam? He's hot, funny, charming, and I love reading about him. Wilbur - Wilbur is SO hilarious. I love him! He comes out with the most ridiculous names to call Harriet. I never know what he's going to say next, but you can tell he is very fond of Harriet. Toby - Toby is Harriet's stalker, but he is the most obvious stalker EVER. He knows it and even admits it, and he doesn't care. He is so funny and an awesome character. Annabel - Annabel is Harriet's Dad's partner. She is pregnant in this novel, and isn't really involved too much until the end. She puts up with Harriet's melodrama, but you can tell she still loves Harriet all the same. Harriet's Grandmother - She takes Harriet to Japan and is a big helping hand for that really. Although she isn't too involved in this book, she is still a great character. Yuka - Yuka is the one who pays Harriet for modelling her clothes. She is very serious and has her doubts about Harriet, but also likes her. Poppy -Something just didn't seem right about Poppy when I first met her in the book. She seemed WAY too nice, and I had my suspicions. Rin - Rin is a fantastic character because her English isn't too good, so she was very funny. There are so many more characters in this book as well as some old. I LOVED meeting the new characters and reading about some of the old ones. Every character has their own BIG personality, and they were written really well. The story is written in first person and the chapters are nice and short. First person works well because we get to see everything from Harriet's point of view and it wouldn't of worked otherwise. I really like the pictures of the glasses throughout the book. It really just adds that extra bit of sparkle to the book. The writing is SO easy to understand. There was no difficulty. Harriet's personality was spread throughout the pages and I loved every minute of it. It was both hilarious and fun. The relevance of the title to the story is very good as it is about Harriet's antics as a model. The beginning of the book was really good as we get to immediately see the funny side to Harriet and how much of a big personality she is. She even re-caps everything that happened in the first book, and everything that happened in the meantime since then. This is really good if there were certain things we forgot when reading the first book. The ending of the book was really sweet and adorable and a perfect ending. I honestly can't wait to see what happens next in Harriet's adventures. Holly Smale is a WONDERFUL author and incredibly talented. This is the sort of book to read if you need to get out of a reading slump. I gave it a very geeky five out of five stars. It totally deserves it! YES. YES. YES. GO GET IT NOW!! If you need a laugh especially. I'm not leaving until you buy it.